If you’ve been watching the antics around the development of the new Yankee Stadium, it shouldn’t be a surprise that another controversy has taken place. 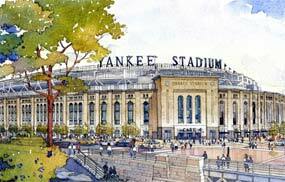 The issue being raised in recent days by Rep. Kucinich (D-Ohio) and New York Assembly Member Richard Brodsky is that city officials may have lent a helping hand to the Yankees by boosting the value of the land for the new Yankee Stadium for property tax purposes. It appears that city assessors jacked up the value of the land under the new stadium so that the Yankees would receive nearly a billion dollars in tax free bonds. Making the land more valuable allowed more borrowing. Juan Gonzalez of the Daily News reported yesterday that the city may have estimated the value of the stadium seven times over. He reports that one estimate stands at $275 a square foot, far from what is land is valued in the South Bronx. Rep. Kucinich isn’t holding back and has requested documents related to assessments from the Internal Revenue Service, National Park Service (the city needed the NPS’s OK since the new stadium is being built on a park upgraded with federal funds), New York City Department of Finance, New York City Economic Development Agency (that via its Industrial Development Agency allocated $942 million in tax-free bonds) and Randy Levine, President of the New York Yankees. Kucinich’s committee expects to hold a hearing in September. It’s worth pointing out that neither Kucinich, the Congress Member from Ohio nor Brodsky represent New York City. One can only guess why elected representatives from New York City are sitting this one out. Brodsky represents a portion of suburbs north of the city and is chair of the Committee on Corporations, Authorities and Commissions. Media alert: I’m scheduled to appear on tomorrow’s (Wednesday’s) edition of Democracy Now! (check out your stations listings or podcast info) hosted by Juan Gonzalez about the Yankee project with others to include guests Rep. Kucinich and stadium subsidy guru Neil deMause. Volkswagen’s Tennessee Subsidy Deal: Are Taxpayers Being Taken for a Ride? Tennessee officials are still celebrating Volkswagen’s announcement last week that it will build a new assembly plant in Chattanooga, describing it as a big step toward their state becoming the nation’s number one auto producer. The state has apparently at least gained the more dubious status of providing the biggest subsidies to date for a foreign-owned carmaker–a package reportedly worth at least a half billion dollars. 1,350 acres of land worth $81 million. At least $30 million for worker training improvements, and a $6 million technical training center. $43 million in road and highway improvements, and $3.5 million for rail connections. $200 million in job tax credits over 20 years. Between $150 million to $350 million in property tax breaks over 30 years, depending on how well Volkswagen meets job and investment targets. However, VW will pay the education portion of property taxes, about $5.5 million yearly. Other subsidies of unspecified value, including machinery sales tax exemptions, and low cost loans and energy credits from the federal Tennessee Valley Authority. Michigan and Alabama were reportedly Tennessee’s main competitors for the VW plant, although the strong United Autoworkers presence in Michigan seems to have made that state a distant third. Putting the cart before the horse, Tennessee’s economic development commissioner said the University of Tennessee would do a cost-benefit analysis of the VW deal later this year, after its costs are fully known. That this evaluation will be very critical may be doubted since a previous UT study of the Nissan headquarters deal (which cost Tennessee state and local governments $197 million) reportedly attributed to it an unlikely economic benefit of half billion dollars a year. Whether a half billion dollars, or $250,000 per job, is in fact the real going rate for an auto plant is less clear, however. The exact importance of subsidies in a company’s location decision remains locked in “a black box”, but is generally limited. In fact, VW spokespeople acknowledged the attraction of the incentives but stressed the particular importance of those for worker skills and site preparation, which form a comparatively small part of the mammoth package. Successive interstate competitions for big auto assembly plants–which began in the Midwest in the 1970s and have occurred repeatedly in the South over the past decade–have often led to overspending as states try to outbid each other, and then to a sense of fiscal hangover when the competition is over. Although the euphoria and industrial recruitment folklore surrounding the deal—Senator Lamar Alexander serenading VW executives with a rendition of “Chattanooga Choo-Choo”– seem to have at least delayed that hangover’s onset. The euphoria has also muted concerns about whether, how and when Tennessee will recoup its “investment,” but those concerns are real. For example, Tennessee officials promise that new auto supplier firms —which may themselves get subsidies to locate near VW– will help offset the deal’s costs. But Business Week has suggested that numerous such firms already located in Alabama and elsewhere in the South could serve the plant with existing capacity. And Alabama is already scheming to land suppliers for the new plant. Continued intense competition like this between Tennessee and other states, and between VW and its competitors, may eventually make the state’s huge subsidy deal seem more like a costly gamble. A boastful sales brochure distributed by developer The Bond Companies resulted in a minor hullabaloo in the Los Angeles last week and increased circumspection of subsidized development by the city’s Community Redevelopment Agency. Bond is the developer of Blossom Plaza, a subsidized mixed-use residential and retail development in L.A.’s Chinatown redevelopment district. The project was originally planned as a 169-unit condominium structure but is now slated as a 262-unit rental development. In addition to market rate and affordable housing, the development includes 40,000 square feet of commercial space, a cultural plaza, and an improved transit-rider facility. The public price tag? The CRA tells me that Bond stands to receive $47.8 million. This includes an $8 million TIF deal, $16.2 million in Proposition 1C Funds (state-funded public improvements), $2.4 million in low-income housing subsidies, and $1 million for the construction of a public plaza. The city is also purchasing a parking garage constructed by Bond for $21.1 million. The suspect brochure, aimed at equity investors, landed Bond in trouble for two reasons. First, the company bragged in writing that getting subsidized financing is central to its business strategy, and further, that it has an entire team dedicated to “mining” subsidies in Los Angeles and elsewhere. Redevelopment Commissioner Madeline Janis told the LA Times last week that she was “disturbed and distressed” by the firm’s marketing pitch. Note: Janis is the co-founder and executive director of the Los Angeles Alliance for a New Economy (LAANE) and serves on the board of directors of Good Jobs First. The second issue of contention was Bond’s projected 42.3 percent rate of return for equity investors advertised in the brochure. The developer itself expects to earn less than ten percent but the higher number nonetheless raised some eyebrows at the CRA. Wary of subsidizing super-profits, the Redevelopment Commission voted unanimously last week to reduce the amount of the city’s subsidies if the venture provides a return in excess of ten percent to Bond. Kudos to the CRA for its bold move to limit subsidies on high profit developments, as well as its admonishment of developers who regard public dollars as an entitlement. Subsidies in NYC: Now and Forever? At today’s Crain’s breakfast in Midtown Manhattan, business leaders got a sneak peak at Congressman and New York City Mayoral candidate Anthony Weiner’s five point plan to spur job creation and retention. For those of us who pay close attention to economic development subsidies, the presentation was more of the same: subsidies, tax breaks and more subsidies. Rep. Weiner highlighted that there are about 3.75 million jobs in New York, about the same number we had in the 1970’s. This despite the billions of dollars spent on job retention and creation. Central to this morning’s discussion was the need to be more competitive with our neighbors in New Jersey and Connecticut. We’d argue this needlessly escalates “the economic war among the states.” Like New York, the benefits of New Jersey’s subsidy programs are questionable. Over and over again, CEO’s of large firms admit they don’t make location decisions based on tax breaks. What firms look for – and Weiner got this part right – are good schools, safe streets, and affordable housing. Companies also need access to an educated workforce, suppliers and transportation systems. Manufacturing firms and small businesses certainly have challenges in the city, which the Congressman acknowledged. Yet, it was unclear how his policies would benefit smaller businesses (which are more inclined to hire locally and less likely to get subsidies) feeling the pressure of high real estate costs and not become a financial windfall for the subsidy machine that is large firms and site location consultants. The good news is Weiner’s understanding of the impact of big box stores was spot-on. When asked why he supported the campaign to bar Wal-Mart from the city he explained the store won’t bring in net new revenue or jobs, just drive out locally owned businesses. Let’s hope that over the course of the Mayoral race, which should kick into full gear here after the Presidential race, Rep. Weiner will find a more nuanced and creative approach to helping New York’s middle class. Will Kansas City Subsidize WMD Plant? That’s the principle at work in an unusual situation in Kansas City involving local subsidies and nuclear weapons production. 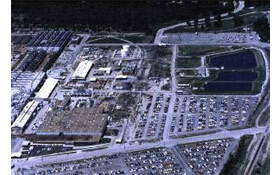 For the past half-century, Honeywell International (and its predecessor companies AlliedSignal and Bendix) has operated a huge facility (photo) in KC that makes the non-nuclear components of nuclear weapons. When the Cold War was still in full swing, there were some 8,000 people employed at the three-million-square-foot plant, which is owned by the federal government. The well-paid workforce, represented by Machinists Local Lodge 778, is now down to about 2,100. Although the Pentagon has rejected calls that it get out of nuclear weapons entirely, the federal government is seeking to produce its weapons of mass destruction more efficiently. That includes downsizing the KC plant. In 2006 the Department of Energy’s National Nuclear Security Administration extended Honeywell’s contract through 2010 but said it wanted to relocate the operation to a smaller site. 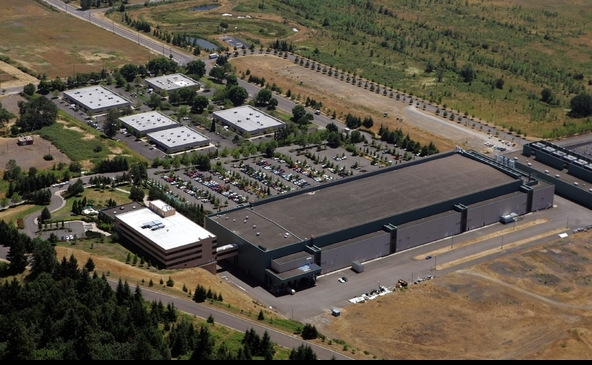 Rather than finding a new government-owned facility, the General Services Administration (in effect Uncle Sam’s real estate broker) decided to have a private developer finance and build the new plant (expected to cost $500 million), which would then be leased to the Energy Department for Honeywell’s use. GSA touted this arrangement to local officials as a way to put the new plant on the property tax rolls (the existing one is tax-exempt), thereby generating an estimated $5.2 million for local entities including the school district. Up to this point, the plan sounded reasonable (putting aside any misgivings about nuclear weapons production). But then it was proposed that about half of the tax revenue be diverted to help pay for some $40 million in road and utility improvements needed at and around the site—in other words, an arrangement like that of tax-increment financing deals. A GSA spokesperson told me, however, that he was told not to call it a TIF. It’s not clear who initiated the TIF-like plan. A May 6, 2008 article in the Kansas City Star (no longer on web) implied that GSA proposed diverting the tax revenues, but the GSA guy I spoke to could not confirm that. Wherever it came from, the proposal is moving forward. A public entity called the Planned Industrial Expansion Authority recently gave its blessing, despite the opposition expressed by several speakers at a public hearing. Among the most vocal opponents are antiwar activists allied with groups such as the PeaceWorks Kansas City, who have been fighting the plant itself (old and new), not just the diversion of tax revenue. I’ve been told that the Machinists Local, concerned to protect the jobs of its members, is supporting the plan, but the union has not returned my message asking for details. The proposal now heads for the City Council. While it was considerate of GSA to put the new plant on the property tax rolls, taking away half of the newfound revenue seems stingy. It comes across as an unnecessary gift for a developer which has not yet been chosen. Given the prevalence of abuses in subsidy programs such as TIF, it is dismaying to see the federal government playing a similar game with its TIF-like plan in Kansas City. It is even more disappointing to see local officials playing along. New York State’s widely criticized Empire Zone program (known as “Enterprise Zones” in most states) is in a state of disorder. This past weekend, the Syracuse Post-Standard reported on the lack of progress by government officials and state agencies in making the program more effective. The article points to mild reform legislation that didn’t pass, and efforts by the state to kick out only a handful of the ineligible companies registered with the program (a subject on which we’ve previously blogged). But as critics call for the state to do more to rein in Empire Zone tax credits, New York City has been expanding them. In recent months, the city has taken steps to bring some previously ineligible companies into the program by granting them the status of “regionally significant projects” (RSPs). Empire Zones were established to subsidize companies creating jobs in economically stressed communities, but RSPs don’t even need to be in an Empire Zone in order to receive the multitude of tax credits available to companies that are. The concept of RSPs was created in 2005 by the New York State legislature, but until late last year all NYC companies receiving Empire Zone credits were physically located with a Zone. The Empire Zone program was created to bring jobs and investment into impoverished communities, but it has strayed far from its initial intent. Clearly, the program is broken (a number of lawmakers think it’s beyond repair). And if something is broken, fix it – don’t add to it. Rhode Island Enacts Subsidy Disclosure! Just before Independence Day, Rhode Island Gov. Donald Carcieri signed two bills into law which will provide full-bodied economic subsidy disclosure, a Unified Development Budget, and other safeguards. Congratulations to Rhode Island’s Poverty Institute and its many allies who raised the issue prominently this past January at their first-ever conference on tax policy; it was well attended by activists and legislators alike. In addition to web-based annual disclosure of outcomes for nearly every major economic development tax break, the new laws will mandate an impact analysis up front for every deal that must include details (including wages and benefits) about all kinds of jobs to be created (including part-time and temporary), the state’s level of subsidy, and how the project plans to maximize local hiring and minority hiring and minority firm contracting. The laws also mandate an annual Unified Development Budget, where all forms of state spending for jobs—including heretofore hidden tax spending as well as appropriations—will be reported to the state legislature. The bills are: 2008 – S2661A, which was sponsored by Senate Majority Leader Paiva-Weed and others); and 2008 – H7953A, sponsored by several members of the House Committee on Finance.